Across the board, from health professionals to policy makers to concerned parents, we are realizing the importance and need for our children to be educated about real food and nutrition. 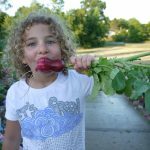 What better way to do this than through a hands-on approach where we support our science curriculum by teaching and participating in the planting, harvesting and enjoyment of eating real foods through an outdoor garden. 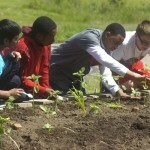 Students will gain an understanding of what a plant is made up of, and its’ needs to survive. We will also cover why our bodies need healthy plant-based foods for optimal health. Students will understand the difference between healthy vs. unhealthy foods. Programs are 1 hour per class and ideally scheduled in the spring and the following fall. In the spring, students learn about plant needs and how our bodies are similar. In your school garden, students will restore, plant and learn the importance of healthy diets while developing essential skills to grow vegetables. In the fall, we will return to harvest and sample nutritious fruits and vegetables to gain appreciation for food and farmers. Agriculture is vital part of Michigan’s economy and what better way to instill healthy food choices by plucking cherry tomatoes from the vine?